Continuing on with my spring nails, these are no exception. I think these are close to the Spring-iest mani I've ever done. Despite being so simple, they were a pain in my behind. Mostly because again, I had a disasticure right before I painted these. I sat down super early in the night with the most brilliant idea. 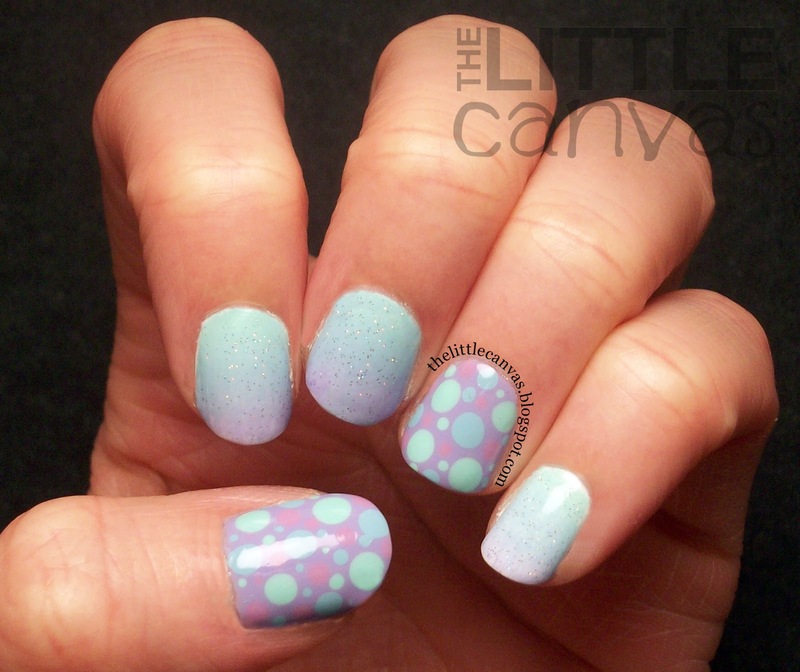 I would do a multi color pastel gradient (4 plus polishes) and then would apply a floral stamp. In my mind, it was GORGEOUS. On the nail, with my non-existent stamping skills, it was not. I might have mentioned this a few posts ago, but I received some stamping plates from Born Pretty for review. I was super excited as I always wanted a set, but never wanted to spend the money on them in case they didn't work right. I've seen bloggers like Nicole from Polish Me, Please! stamp her nails like a boss numerous times and make it look so easy, I figured it would be a quick way to do nail art. I smashed I was wrong, and well Nicole needs to fly here and give me some stamping lessons before she has her little bundle of joy! By the way, congrats to Nicole, Amanda from Fashion Footing, and Heather from Peace, Love, and Polish. All three ladies are expecting, and I believe Heather is due any day now (or by the time this post is published she might have already had her baby). How fast I go off on a tangent. 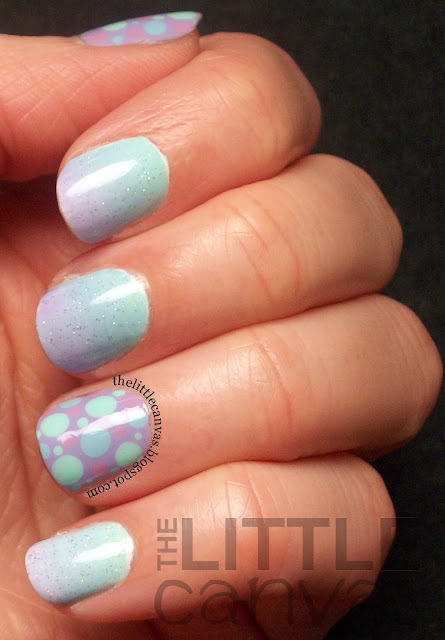 Anyways, I still wanted to do a gradient, so I opted to do a mint, to blue, to purple gradient, with a dotted accent nail. Wasn't too fond of them due to the disasticure, but regardless, they came out just dandy. Let's take a look. This was my first time using INM Northern Lights, and I LOVE IT. I used to use China Glaze Fairy Dust for my fine holo polish, but it's odor was giving me the worst headache. In addition to the headache, the polish got super thick, super fast. Oh, and it took ages to dry!!! I would always end up ruining a manicure because of it's dry time. INM Northern Lights is a perfect replacement. Made by the same company who makes my amazing Out the Door top coat, it has the exact consistency and dries just as fast, if not faster. What I love about it also is you can control the amount of holo glitter you want. All the holo specs settle at the bottom of the bottle. Depending on how much you shake it up, the glitter gets suspended in the base at different volumes. The more shaking, the more glitter. Love this polish. Even though the photos don't show it, my nails were super bright. Except that damn pinkie, for some reason my gradient was like "haha Alaina, I'm not going to transfer well on this nail and only this nail...so enjoy!" For my gradient, as always I started with a base of white polish, then painted the colors on to the make up sponge, then dabbed on to the nail. For the dotted nails, I used different sized dotting tools and dotted my little heart out. What do you think? Love or hate this color combo? Hopefully my next manicure won't be the birth child of a disasticure. We shall have to wait and see. Until then, <3. Delicate! that's the word i was looking for to describe them!! Thank you! Mint, blue and purple...the color choice just can't be more perfect than this! Thank you, doll! I miss you, where have you been lately! ?